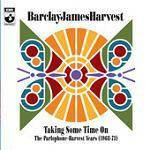 More information: Comprehensive 5 CD set of all the band's material from the Parlophone and Harvest label days at a bargain price. Includes remastered versions of their four Harvest albums ('Barclay James Harvest', 'Once Again', '... and other short stories' and 'Baby James Harvest'), plus A and B-sides of all their singles from this period, BBC sessions, alternative versions etc. Exclusive to this set are early mixes of three songs from 'Baby James Harvest' which were broadcast by Bob Harris in 1972.